DogTrekkers touring the Central Coast wine country will leave with happy tails after stopping by any one of the area’s dog-friendly vineyards. San Luis Obispo County’s wineries dot country roads, and we have dog-tested a few in the Paso Robles growing region that are sure to please even the most discerning palate. Wine tasters who would like to be relieved of driving duties may utilize the services of Breakaway Tours, where you and your four-legged friend(s) will ride in private, air-conditioned comfort to three or four dog-friendly wineries. Complete your experience by adding their winery picnic lunch, including Scooby Snacks, all served up with their signature “Seriously Fun Wine Education”. 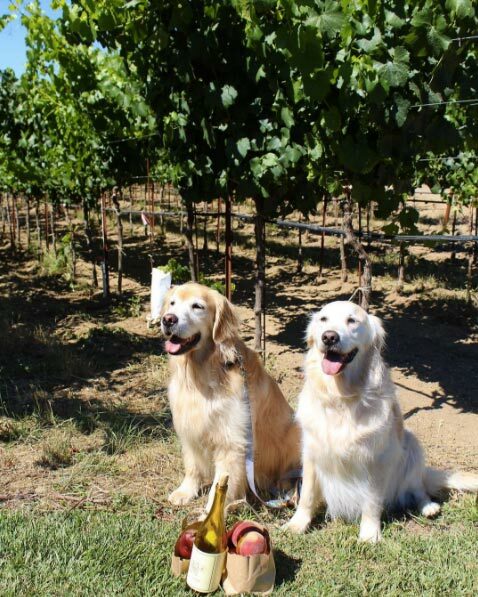 Adelaida Winery is a “must see” for dog lovers with a passion for wine. This family-owned farm is certified through the Sustainability in Practice program and brings a long list of accolades to the table. Dogs are encouraged, and while humans sample estate wines, canine connoisseurs are attended to with fresh water and locally made organic dog treats. Winery dogs can be found all along the Highway 46 Paso Robles Wine Trail, happily mingling with two and four-footed visitors alike. Whalebone Vineyard's old English bulldog, Tiffany, is a local legend, and her mug graces the label on their delectable 2008 red blend titled Boneyard. Tasters sipping through Whalebone’s menu are welcome to have friendly, leashed dogs in the tasting room and patio. In Paso Robles’ two top-notch RV parks, Vines RV Resort and Wine Country RV Resort, welcome campers with canines. 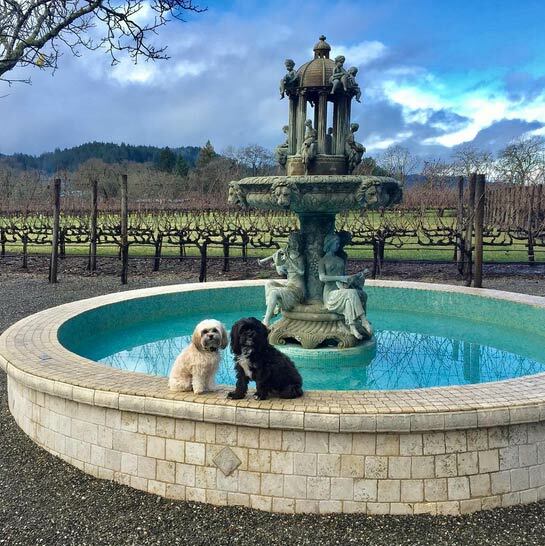 The Wine Country RV Resort is particularly accommodating to dogs with two immaculate off-leash dog areas; a dog-friendly horseshoe pit, and a small, neighboring vineyard where camping dogs can sniff around to their hearts’ content. Also provided by the friendly staff is a list of nearby dog-friendly businesses, including Eos and Eberle wineries, which are within walking distance of Wine Country’s front gate. Both wineries have dog-cordial patios, and Eberle goes above and beyond with dogs welcome in the tasting room and cave tours, crowds permitting. While at Eberle, make sure to say hello to the winery dogs, standard poodles Roussane and Zinfandel, while sipping a luscious Full Boar Red.